The matter that makes up distant planets and even-more-distant stars exists under extreme pressure and temperature conditions, and includes the noble gases, some of which - such as helium and neon - are household names. New work by a group from Carnegie, the University of Edinburgh, DESY, and Howard University used laboratory techniques to simulate stellar and planetary conditions, and observe how noble gases behave under these conditions, in order to better understand the atmospheric and internal chemistry of these celestial objects. Using a diamond-anvil cell to pressurize the noble gases (helium, neon, argon, and xenon) to more than 100,000 times the pressure of Earth's atmosphere (15-52 GPa), the group simultaneously heated the samples with a laser to temperatures up to 2800 K. The gases are called “noble” due to the fact that they do not readily react with other elements. Of particular interest were changes in the gases’ ability to conduct electricity as the pressure and temperature changed, because this can provide important information about the ways that the noble gases do actually interact with other materials under the extreme conditions of planetary interiors and stellar atmospheres. Noble gases are not normally conductive at ambient pressures, but conductivity can be induced under higher pressures. The results show that helium, neon, argon, and xenon transform from visually transparent insulators to visually opaque conductors under varying extreme conditions that mimic the interiors of different stars and planets. This has several exciting implications for how noble gases behave in the atmospheres and interiors of planets and stars. For example, it could help solve the mystery of why Saturn emits more heat from its interior than would be expected given its stage of formation. This is tied to the ability, or inability, of the noble gases to be dissolved in the liquid hydrogen present in abundance in the interior of gas giant planets such as Saturn and Jupiter. In Jupiter and Saturn, helium would be insulating near the surface and turn metal-like at depths close to both planet’s cores. The change from insulator to metal occurs under pressure and temperature conditions at which hydrogen—the main constituent of these planets—is also known to be metallic. It is predicted that helium is, in fact, dissolved in hydrogen under these conditions on both planets and, furthermore, that the miscibility of hydrogen-helium mixtures is correlated with this kind of insulator-to-metal transformation. However, there was an observed difference in the behavior of neon between the laboratory conditions corresponding to conditions within the two planets. The results indicate that neon would remain an insulator even in Saturn’s core. In this case, an ocean-like envelope of undissolved neon could collect deep within the planet and prevent the erosion of Saturn’s core compared to its neighbor Jupiter, where core materials, such as iron, would be dissolving into the surrounding liquid hydrogen. This lack of core erosion could potentially explain why Saturn is giving off so much internal heat compared to that produced by Jupiter. 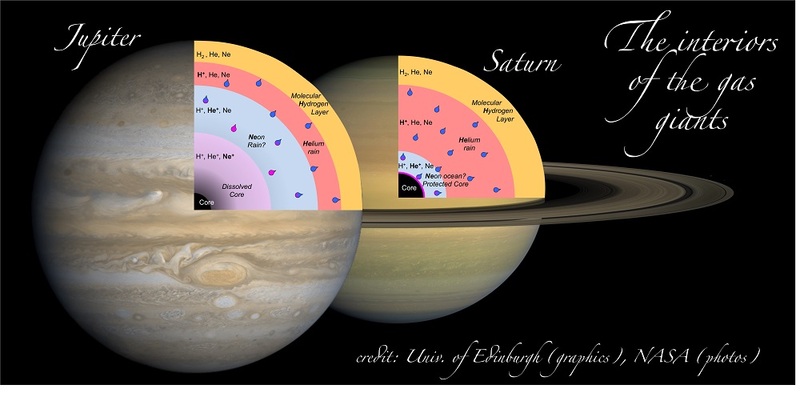 Erosion of a planet's core, as in Jupiter, leads to planetary cooling as dense matter is raised upward during mixing, converting heat to gravitational potential energy, whereas in Saturn denser material is allowed to collect at the center of the planet, producing hotter conditions. The fact that Saturn gives off a great deal of internal heat has been a longstanding mystery, and these findings could provide the key to solving it. Another implication of the research applies to white dwarf stars, which are the collapsed remnants of once-larger stars, having about the mass of our Sun. They are very compact, but have faint luminosities as they give off residual heat. Dense helium is known to exist in the atmospheres of white dwarf stars and may form the surface atmosphere of some of these celestial bodies. The behavior of helium at conditions simulated by the laser-heated diamond-anvil cell indicate that this stellar helium should be more opaque (and conducting) than previously expected and this opacity could slow the cooling rates of helium-rich white dwarfs, as well as affect their color [S. McWilliams et al., Proc. Nat. Acad. Sci. 112, 7925 (2015)].